This adds an important dimension to the Jonah story; a precursor of the crucifixion of Christ and resurrection after three days. Now for the very early Christians resurrection was inextricably linked with baptism; it was seen as a new beginning to life. For more on the significance of baptism and its representation in early art, read Baptismal Imagery in Early Christianity by Robin M Jensen. 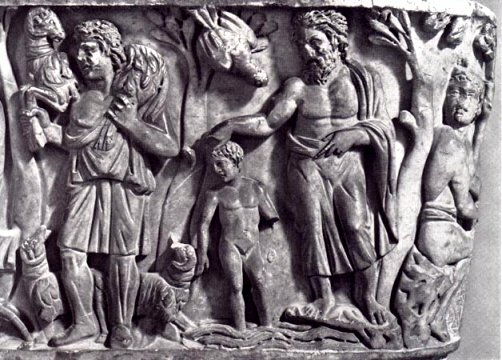 Jensen discusses why early images of Christ being baptised by John the Baptist show Christ as a naked child, as here from a sarcophagus now in Santa Maria Antigua in Rome. It dates from around 270. I have written about this in my posting on John the Baptist here. In brief, these images show baptism as death and rebirth, a cleansing of all past sins - rebirth as a young child. Now lets expand the image to show more of the sarcophagus. To the left is Jonah, after emerging from that giant fish, naked, reborn. Catacomb frescoes and sarcophagi are largely what survives of early Christian art, so inevitably the themes of death and resurrection predominate, though there is much else - here, next to Christ stands the Good Shepherd, and in the centre is an orant figure, and a seated one, sometimes described as a philosopher. Could it represent an Evangelist? It is easy to assume that the earliest Christian imagery would be unsophisticated renderings of biblical narratives, but what we learn here is that this was far from the case. The linking of biblical events, often seen as allegorical, was complex, and possibly influenced by Gnostic philosophy.